Bring and Buy Sale raises £2633 – As part of an Enterprise initiative, all S1 pupils were involved in the annual Bring and Buy Sale to raise funds for their residential visit to the Cairngorms in May. Some of the money raised goes to charity and S1 are currently in discussion about the charities they are going to support from the money raised. 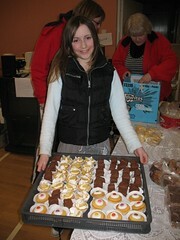 In preparation for the sale, pupils encouraged spring cleans at home and visited local businesses asking for support. Once again, we were overwhelmed with the response. Friday, prior to the sale, all S1 pupils were off timetable for the day, in order to allow them to get the Community Hall prepared for the sale.This they did, and they worked extremely hard. By 6pm on the Friday, the Hall was ready. The day of the sale was amazing and S1 pupils cannot thank enough all those parents, pupils, friends of the school, local businesses etc. for the tremendous support given.To name you all individually would take up this entire newsletter and we would be worried about missing someone out ! The raffle prizes alone were wonderful and very kindly donated- thank you. S1 pupils were delighted to find out at registration on the following Monday that they have broken the record amount made by previous years by almost £300. Click here for photos. Mr Milner would like to thank S1 for working so well over the 2 days- he is almost looking forward to the Nethybridge trip ! S3 Exams – These start one week after we return to school, following the Easter break, and pupils are in possession of their exam timetables and revision guides. Parents/ Carers – please ask to see this information as your support at this time is crucial. This will be their first experience of sitting exams under strict conditions and with invigilation. Young Leader Award – S1 and P6/7 pupils from Gairloch primary have been successful in achieving the first Young Leader award in Highland. Working together, they attended a training day at the High School where they learned how to plan, set up and run activities for the playground. The day was followed by an assessment afternoon that involved them all in groups, planning and leading activities for a small group of younger primary pupils. This was very well done and all pupils involved successfully achieved the award. This award sets the pupils up well for the Leaders Awards that are run in the High School. The Young Leaders will now go on to set up and run playground activities during their intervals at school. Inter House Basketball – Over the last couple of weeks the Basketball competitions have been running and will continue on until the last week of term. Results so far – Senior Boys Tollaidh 1st, Kerry 2nd and Maree 3rd. Senior Girls Maree 1st, Tollaidh 2nd and Kerry 3rd. Junior Boys Kerry 1st, Tollaidh 2nd, Maree 3rd. Congratulations to all participants involved in winning and gaining points for your house. Well done to the House captains who have a difficult job of pulling the teams together. Keep up the good work! 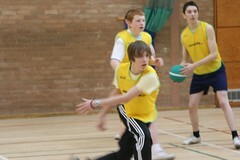 Inter House Rugby – After a hard fought Junior and Senior Competition, Kerry was the winner with 12 points. Tollaidh and Maree were second equal with 6 points. Thanks to House Captains who did a sterling job in organising the teams, where a number of pupils were recovering from injury and could not take part. Ross Sutherland RFC hosted schoolboy rugby teams from St John’s Canada. Rugby matches between the Canadians and Ross Sutherland Under 18 and Under 16 teams took place on the afternoon of Monday 10th March in Invergordon. Three Gairloch pupils took part in this event – Matthew Fothergill, James Staddon and Gavin Gourlay. Youth Highland Event – The Den staff took pupils through to Inverness for various competitions against other Highland Youth Clubs. Gairloch children brought home three trophies – junior football, mixed junior dodgeball and junior boys badminton. Well done all – click here for more! Air Training Corp (ATC) Success – A high proportion of Gairloch High pupils take part in the ATC. This very successful group enjoy many fun activities such as survival training, shooting, learning to navigate and flying small planes. Recently they won the Hinshelwood Trophy for being the best unit in Highland Wing 2008. 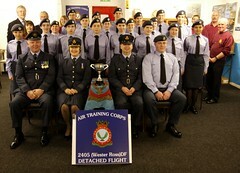 They were presented with their trophy on Monday 10th March by Group Captain Urquhart. Photo and story here. Senior Outdoor Education trip – Last weekend a group of senior pupils went off on an adventure to Badaguish Outdoor Centre near Aviemore. The pupils did some hillwalking, winter skills, mountain biking and indoor climbing. This event was organised by Mr & Mrs Johnston accompanied and supported by Miss Dean & Mr Sutherland. Click here for more. Easter Study Club – This successful annual event involves staff and pupils working for three days during the holidays to focus on exam preparation for May and June. This year these classes will take place on Tuesday 1st April to Thursday 3rd April inclusive. S4-S6 pupils have the details. School opens for pupils on Tuesday, 8th of April. Our largest gala yet required three buses to transport participants today. Swimming for House points every pupil, no matter what the level of swimming ability, had the chance to contribute to the final scores. In the end Maree won with Kerry following second. Tollaidh came third. In the House competition Tollaidh are ahead overall at this stage. Over recent weeks some other pupils have been involved in swimming lessons and the following pupils were awarded certificates: Charlie Mays, Eadan Duncan, Gary Williamson & Anna Duncan. Neil Macleod, Head Boy, and the pool staff provided invaluable help with this group. And well done to the other competitors Neil MacLeod, Mark Rogers, Jacob Naylor, Alex Warren and Kerry Smith – all scored valuable points for their House. Youth Highland Event – The Den staff took pupils through to Inverness on Saturday 14th March for various competitions against other Highland Youth Clubs. Gairloch children brought home three trophies – junior football, mixed junior dodgeball and junior boys badminton. Well done all! Click on the photo to see more of the events. Another very successful sale took place in the Gairloch Community Hall today. Lots of parents, pupils and other members of the community recycled books, bric a brac, clothes and toys! Once again we also had lots of fabulous prizes donated by local businesses. A very big thank you to everyone who helped make this such a great event for the pupils. In total we thought we had collected £2590! Some more money came in after the event and the new total is £2633.41! This is an amazing amount some of which will go to charities selected by the pupils. The rest will support the S1 trip to Nethybridge. Click here for more photos. 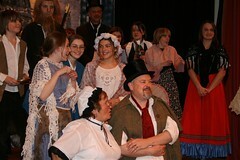 On three nights of near full attendance parents, friends, family and pupils enjoyed a great production of Oliver. The young cast did an excellent job performing this challenging and entertaining show. Click here for lots of photos. Now there are black and white scenes as well! Sarah Urquhart-Taylor, for her enthusiasm to help with anything and everything. Caroline Middleton & Poolewe Drama for costumes. Isla MacRae from Eden Court, who gave so much of her time to help us with the lighting. Lorna MacKenzie & Sylvia MacKay for sales of tickets. Members of the Parent Council & staff – interval teas. Many thanks to everyone in Gairloch High School for their wonderful support, without which this show could not have taken place. Thanks also to parents and friends willing to lend props & costumes, and also to act as a taxi service after rehearsals. It is never easy to organise rehearsals after school with our children living so far away in many cases; your willingness to help is an invaluable resource for our school.